Amazon CEO Jeff Bezos created a buzz in the world of e-commerce in 2013 when he revealed what most expected to become the future of product delivery. Their Prime Air service would feature small drones that were capable of carrying up to 5 pounds of cargo that could be delivered to your front door in 30 minutes or less. It was an idea that seemed to be something that came from science fiction. If you were to visit the Prime Air page on Amazon today, you would find that the promotional video for the system has not received an update since 2016. 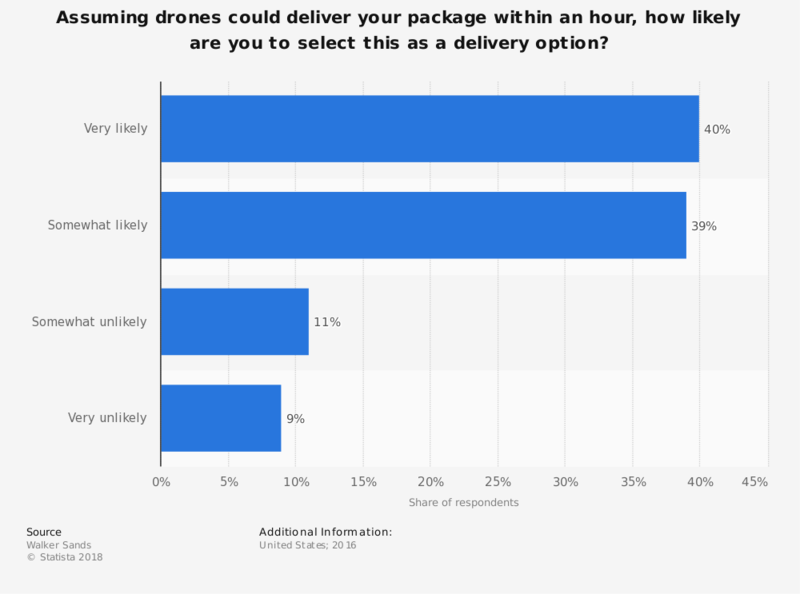 There is a legitimate need to feature rapid parcel delivery, but will unmanned aerial vehicles be able to offer delivery services that provide meaningful results? The Associated Press followed up on the lack of delivery drones in the skies from Amazon in 2018 to see how the industry was progressing. Their research discovered that almost 110,000 commercial drones currently operate in the United States. That number is expected to top 500,000 within the next four years. Most of these unmanned vehicles are utilized today for industrial purposes, such as surveying, instead of using them for delivery. That means the delivery drone industry is still trying to evolve. It is happening much more slowly than the hype from 2013 predicted. Amazon hasn’t abandoned its quest for Prime Air because it sees the value in the pros and cons of delivery drones. 1. They can deliver products quickly to virtually any location. The purpose of a delivery drone is to provide services for delivering objects or commodities rapidly and in out-of-the-way locations. These unmanned aerial vehicles can be programmed to deliver specific items from their headquarters to a designated area – the address of the individual who ordered the product. It is a service which can provide a bulk transfer of materials when consumers need to receive their items quickly and without damage. 2. It improves time management for all parties. When delivery drones are working to provide services for an organization, then consumers and the employees involved in the process both benefit from the increased efficiency. It allows people to focus on other essential items of the purchasing process. With accurate locating programs, this service offers the potential of a lower error margin assuming that the addresses submitted through a shopping cart are accurate. Consumers receive their goods faster, companies can increase their turnover rate, and that leads to higher levels of productivity. 3. Delivery drones conserve energy. The emissions that a delivery drone is responsible for are far fewer than standard packages using traditional delivery mechanisms. There would no longer be a need for airplanes to transport some goods, delivery trucks to offer home delivery, and other fossil fuel costs because warehouses would be conveniently located in most urban areas. That reduces the price of shipping and handling because there are fewer logistics to complete. Although this process could reduce some job opportunities, there would be an increase in positions related to drone programming and maintenance. 4. It is a technology that helps us to save time as well. Delivery drones allow organizations to divert their current human resources toward creative, innovative pursuits that can expand their product lines or services even further. Workers will have more time to see to the regular operations of the company while ensuring a higher quality of product being received by their customers. Instead of paying for repetitive activities that keep production levels artificially low, this technology makes it possible to spend more time and money on ideas that could one day change the world. 5. Delivery drones offer a safer delivery system. Drivers that bring packages to a consumer’s home are assuming a level of risk because of their road-based activities. There is always a chance that they could be involved in an accident, run out of fuel, or encounter delays due to road construction. Delivery personnel are sometimes exposed to dangerous environments as well, such as a slippery set of entryway stairs. Delivery drones create a safer system for delivery because they remove many of these factors from the equation. There is always the added risk that a drone could fall from the sky or accidentally release its package, but the comparative perspective places this issue in the advantage category. 6. They would offer a higher level of efficiency. Thanks to GPS technologies, delivery drones could automatically navigate to a specific address when a product is ordered by a consumer. This technology has a higher success rate compared to humans when performing the same task. Although there will always be homes that are not accurately charted by these systems (like a GPS guide telling someone to turn right, which would lead them into a building), this issue is one that will eventually resolve as the technology continues evolving. 7. It would have a positive effect for shareholders. One of the key benefits that a company would experience when using an automated delivery system that includes drones is an improvement in efficiency. That would translate into a cost-savings process that could reduce expenses for the organization. Shareholders would benefit from a potential increase in dividends, while senior managers might receive rewards for their creativity with a bump in their pay. There would be fewer workers potentially needed as well, which would further increase these compensation factors. 8. Delivery drones could reduce consumption levels. Over-consumption is a growing problem in our world today. It causes us to generate more trash, pollute more often (intentionally or not), and spend more instead of saving our resources. Although having more access to products purchased online might seem like it would encourage additional spending, the trends in online shopping show the reverse is often true. Time Magazine researched the issue and found that people make fewer impulse purchases and consume less when they shop at home instead of going to a store. 1. Delivery drones are an expensive device. The cost of adding delivery drones to a company’s services requires a significant investment in the infrastructure of the organization. That’s why there are only a few large businesses right now which are even considering this technology. The average price of a drone can be up to $500 for one that is capable of making an accurate delivery. 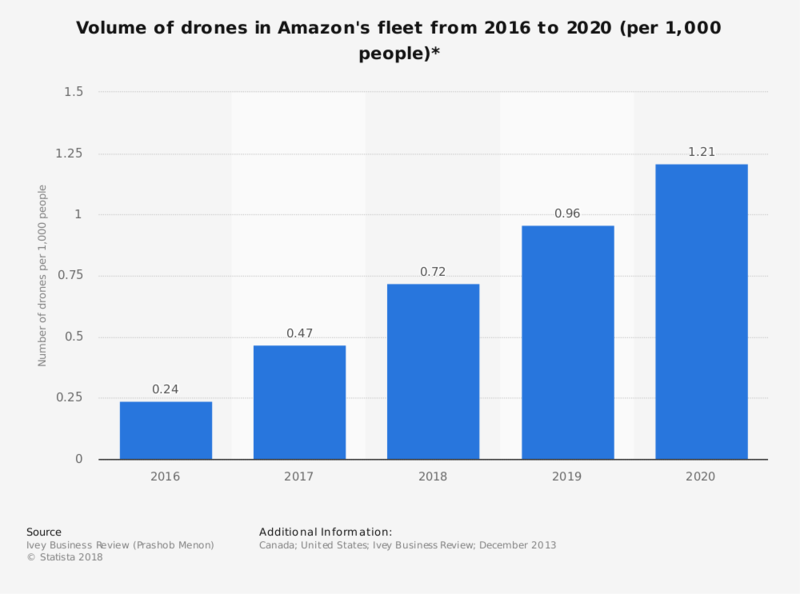 Although smaller drones may be in the $50 price range, a company like Amazon would require tens of thousands of them (and the programming staff for them) to turn this idea into something that isn’t science fiction. 2. It requires an improvement in battery technologies to be effective. On Amazon’s Prime Air web page, they say that they are “committed to making our goal I’m delivering packages by drones in 30 minutes or less a reality.” One of the reasons why this quick turnaround is necessary is because of our current battery technologies. The power requirements of the average delivery drone could cause it to lose power in 20 minutes or less. That may not offer enough flying time to get the package to its intended destination – or have the drone return to company headquarters. If the delivery drone failed to meet its obligation to a consumer, then there would be an increase in customer complaints, product costs, and insurance premiums. When it would not be able to return to the company, you’d still have the logistics of replacing or finding the missing drones. 3. Delivery drones require a technical familiarity with the product. Amazon seeks to create a technology where programming can replace a human operator. The reason behind this push for unmanned aerial vehicles is that the cost of purchasing automatic delivery drones is cheaper than training pilots who can accurately follow a flight plan. Even when there is a technical familiarity with the product, human operators would need to spend time in the operating manual to ensure that they were flying items correctly. There would need to be a significant investment in time and effort before this service could ever get off the ground. 4. It creates a higher risk of defects during operations. Any vehicle that we use to deliver products around the world creates a risk of a defect changing the process for a company. Airplanes can break down on a runway unpredictably. Delivery trucks can refuse to start. This risk is something that all businesses face when managing their logistics. Delivery drones, using our current technologies, experience a higher risk of failure when compared to traditional options. Industrial drones have shown that their systems can malfunction within the first year of putting the device to work. Should one of these defects be present during delivery operations, then it would disrupt the logistics of the company, add more expenses to the budget, and create other potential issues as well. 5. There is a risk that the delivery drones could be stolen. It does not take much skill to disconnect the power system from a delivery drone. This risk is another issue that companies must face if they wish to adopt this express delivery option. Anyone could take the equipment away at any time by ordering a small product from their preferred e-commerce platform. Once this action occurs, it could be challenging for the business to have any way to recall their property. Regulations and laws would likely need an update to accommodate this risk if this service will ever become a reality. 6. Delivery drones offer a privacy risk that we must consider. One of the ways that Amazon and other companies would likely provide delivery services with the drone is through the use of a camera. Streaming video to the company’s headquarters would allow supervisors to know if a delivery was successfully completed. This technology could help to lessen the risk of theft in the future as well. The problem with a camera being equipped to a drone is that you can pick up video of people and properties who are not associated with the transaction. There would be no consent given by people who are caught on this stream. An update in laws and regulations would need to apply here as well. 7. It could cause delivery prices to rise exponentially. Automated delivery services like what a drone could provide will likely cause the cost of receiving an item to arrive, even if options for non-rush delivery become available. Amazon sees this as being a 30-minute service, so the cost would likely be similar to what express deliveries are today. If you want an overnight guarantee right now for a package shipped through the USPS, then the minimum cost is $25.50 – and that is only for “most locations.” If you go out to 3 business days, then the minimum price is $7.35. Although Amazon might include this option in the Prime subscription, it would only be available to select customers, and it might increase the overall cost of membership for everyone. 8. There would be fewer job opportunities for unskilled workers. Whenever there has been a shift in technology that changes the way employees work, most businesses take the approach that the issue is “not their problem.” Workers would need new training programs just to keep their jobs. There would also be fewer entry-level positions where no experience is necessary, which places a higher level of pressure on the educational programs that can equip people for work. Most of these structures are already incapable of serving the needs of their community at a 100% rate. Delivery drones would simply increase the issue. 9. It could offer another way to breach our data privacy. Is it unlikely that a company like Amazon would use the data from a drone delivery to their advantage? If what we have seen from Facebook in 2018 about privacy and data, then delivery drones could take this issue to another level. The logistics of this delivery mechanism would create new data points that could be used to upsell, advertise, or retarget consumers in ways that we have never seen before. That information could help the criminal element in society to find new avenues of identity theft, home invasion, and more to create harm in society as well. 10. There is a threat of property damage to consider. Delivery drones are not an infallible technology. There is an excellent chance that they could inadvertently damage a home while performing their function. The only way to counter this issue would be for homeowners to install landing pads for the drones at a safe location on their property. This tech option could come with an RFID signal that only activates when a delivery is authorized, which could help to reduce the multiple data streams that may be available. These delivery drones pros and cons are mostly hypothetical at this stage because the technologies we use for this logistics option are still under development. This option could become the standard express delivery service for customers who shop online in the future. It could be an idea that is less than five years away from becoming a reality. If we can learn from our mistakes while continuing to fund research and development products, more companies might think about adopting a service like Amazon Air in the future.